Have Theodoric on the front. The Ostrogothic Kingdom was created and destroyed by conquest and, throughout the realm’s short life, the army remained a central feature of its politics and society. A discussion of military affairs in Gothic Italy therefore requires that attention be devoted to such seemingly unmilitary issues as the Gothic settlement and its nature and the kingdom’s ethnic politics, which have been the focus of much, sometimes fierce, debate in recent decades. This chapter will be organised according to three main chronological phases: first, the period of the conquest; second, Theodoric’s reign as king of Italy; and finally the Gothic wars. This will permit the examination of change through time as well as allowing the analysis to confront issues specific to each sub-period. Although the Ostrogothic Italian kingdom spanned only three generations, it is important to remember that Theodoric’s was a long reign by any standards. The dynamics at work meant that the troops who accompanied him across the Isonzo in 489 were very different from those who undertook the military operations of his last years and entirely unlike those of the Gothic Wars. Theodoric’s Goths: Army or People? The forces that Theodoric led across the Alps in 489 had developed out of more than one Gothic group. Principally they originated in Theodoric’s own armed following and in that of his namesake, Theodoric Strabo (“the Squinter”). Neither group can be considered as “the Gothic people”, regardless of how later sources, from within the Italian kingdom and outside, may have wanted to create that image. The very fact that two such Gothic groups existed gives the lie to such a supposition. Nor should we suppose that these were the only two such groups; they were simply the most numerous and, therefore, the most politically and militarily significant. Like the others, these bands originated in the instability that followed the fragmentation of Attila’s short-lived trans-Danubian “empire” in the 450s. In Attila’s polyglot empire, beneath a unifying Hunnic political identity, his subjects doubtless had several levels of ethnicity. In a justly famous story, the East Roman ambassador Priscus met a Greek in Attila’s camp,but this “Greek” clearly also fully regarded himself as a Hun. It has long been pointed out that most of the Huns known to us bear Gothic names, not least Attila and his brother Bleda. Such material culture as can reasonably be associated with the Hunnic Empire emerges from a mixture of local Roman and Barbarian traditions. After Attila’s death, civil strife broke out between his sons and other former commanders and troops. Often depicted as a rising of “subject peoples”, this conflict seems more reasonably described as a succession crisis in which those opposed to the Attilan dynasty adopted non-Hunnic identities, bringing back to the surface those lower-level ethnicities, like Priscus’ interlocutor’s Greek identity, which had always been there. Following the defeat of Attila’s sons at the Nedao, a somewhat bewildering array of “peoples” came fleetingly into view in the wreckage of the Hunnic “empire”. For some, even a solid historical existence as peoples can be questioned. We know of only three named Skiri: Odovacar, his father and his brother. It is difficult to decide whether Skirian identity ought to be considered “ethnic” or familial. Nonetheless, a successful family might attract enough followers for its kin-group identity to spread, be adopted and become an identity that operated in uncontrovertibly “ethnic” fashion. After all, historians are accustomed to describing post-imperial Gaul, its people and culture between the late fifth and eighth centuries using a familial identity originating precisely in Odovacar’s generation: Merovingian. The families of the two Theodorics stressed their Gothic identity, just as other people with Gothic names had adopted, or continued to proclaim, a Hunnic ethnicity. Others still made political claims based around Gepidic, or Herulian, or Rugian, identity. Whether any of these factions should be considered a revival or reappearance of a tribe with a long pedigree seems questionable. One recent debate has been whether the Goths formed a “people on the move”, as in traditional Völkerwanderung interpretations, or, as in more recent works, a simple military force: an army. This controversy is incapable of easy resolution. Extreme interpretations, at either pole, are unsatisfying, not least because the terms “army” and “people” are rather trickier to define than might be assumed. Consequently, between the “polar” readings conclusions are more difficult to pigeon-hole as either “army” or “people”. Nevertheless the issue is of considerable relevance to this chapter. Our sources mention that the Gothic factions (like, presumably, the others) had women and children in tow. This has been taken as proving that they should be considered a “people” on the move. This does not necessarily follow. Roman armies took non-combatant women and children with them too, and so did most armies until well into the twentieth century. While sounding a note of caution, however, this does not authorise us completely to disallow the interpretation of the Goths as “people on the move”. Pursuing the “factional” interpretation permits an intermediate course to be steered. We might envisage a social group including women and children, but with young male warriors in the following of more established leaders nevertheless forming the most important element. The issue of age has not fully been taken into account in discussions of the Gothic settlement of Italy (or, indeed, in that of other “barbarian” settlements). After a long period of almost constant campaigning, in and out of official East Roman service, three consequences can readily be imagined. One is the knitting of warrior bands into established, quasi-permanent bodies of men. Living together year-round, practising weapon-use and regularly fighting alongside one another, these would acquire most of the significant attributes of regular military units and the whole organisation those of a permanent army. Indeed that seems generally to have been how the Ostrogoths functioned in Balkan politics in the 470s and 480s. The second consequence of the Goths’ career in this period, however, will have been the steady acquisition of wives, children and, doubtless, other camp followers. Paradoxically, then, as the Goths took on more of the form and functions of an army, they will have become more varied in social composition. The third consequence, all too-often forgotten, is that throughout this time young warriors got older; mature warriors became old and possibly infirm. Without an established place in Eastern Roman social, military and political structures, they could not settle down. They had little option but to continue to move and – as long as they could – fight with the rest. This too made the Goths, even if originating, organised and functioning as an “army”, much more like a “people” than most military forces. Therefore, to see the force that headed for Italy in 489 as, by then, looking rather more like a “people” than a normal army, one need not envisage Theodoric’s Goths as originating as a tribe or people that upped sticks and moved en masse. Put another way, once the dynamics of the situation are thought through, even a narrowly military reading of the Goths’ origins and structure (like this one) must ultimately see the force that arrived in Italy as something more socially variegated. That must impact significantly upon how we understand Gothic settlement. The Italian military background is also important. The western Empire’s fifth-century decay produced crucial changes in Italian politics, as elsewhere. The loss of direct imperial control over Africa in the 420s and 430s was critical. The seaborne threat from Carthage meant that a significant force had to be stationed throughout the Italian peninsula, rather than just in the north, which had hitherto not been necessary. A key element of fifth-century politics was the increasing separation and rivalry between Italian and Gallic aristocracies. However, whereas the fourth-century Italian aristocracy had had little option but to accept the de factoshift of the imperial core to the Rhine frontier, it now had an armed force to help it ensure it commanded the centre of politics and patronage. Control of the Italian army became crucial in peninsular politics, as Ricimer’s long period of dominance makes very clear. Although unable to establish itself over the factions based upon the Gothic and Burgundian armies in Gaul, the Dalmatian army, or the Vandal forces in Africa, it nevertheless retained control over Italy, expelling the Gallic/Gothic faction in 457 and the (legitimate) Dalmatian claimant in 475 as well as fending off occasional attacks from African Vandals and trans-Alpine Alamanni. Recruitment remained problematic, however. The lack of effective control over fiscal resources beyond Provence and the Narbonnaise in Gaul or Tarraconensis in Spain greatly reduced any Italian emperor’s income. Simultaneously, the peninsula became a political hot-house as the senatorial nobility, likewise cut off from properties and revenues abroad, competed with lower-order aristocrats for honours, titles and patronage, especially at a local level where wealth differences were now much reduced. This made the government’s ability to levy troops as well as taxes more problematic. It was preferable to use taxes to pay for the recruitment of soldiers from outside Italy, specifically from barbaricum and especially trans-Danubian barbaricum. These, at least initially, lacked local ties and were more easily employed as a coercive force. Not surprisingly, therefore, the governmental resources used to pay the army were referred to as the fiscus barbaricus. Nonetheless, crucial dynamics operated here as well as within the Ostrogothic army. Roman troops’ remuneration had always involved land and late Roman forces, as noted above, lived, and sometimes moved, accompanied by wives and children. Recruits – like Goths – get older, marry and settle down. Military service was hereditary,so any children expected, in time, to follow their fathers into the army, which, over time, became as integrated into peninsular society and politics as any other group. The soldiery that serially deposed Julius Nepos and Romulus “Augustulus” doubtless contained significant numbers of men born and raised in Italy, even if serving in units with barbarian titles: second-generation “Italo-barbarians”. This discussion casts the confrontation between Odoacer’s and Theodoric’s armies between 489 and 492 somewhat differently from the clash of barbarian armies sometimes imagined. Both sides originated in a very specific, fifth-century imperial context. The similarities between them doubtless explain the drawn-out, long-indecisive nature of the struggle and the common changing of sides. Nonetheless, Theoderic’s troops’ military experience and long practice in operating as units, was probably crucial to their eventual victory. The similarities between the opposing sides may also help us understand the Gothic settlement in Italy. The Gothic settlement has probably been the most controversial issue concerning Theodoric’s army and Italian society and politics. It has been dubbed, misleadingly in some ways, “the Hospitalitas debate.” The name hospitalitas(loosely, hospitality) came from a late Roman billeting law, describing the division of billets into thirds, the householder taking two and the soldier the other. In the Wars, Procopius claimed that the barbarians appropriated of a third of the land of Italy, and Cassiodorus’ Variae allude to Gothic “thirds” or “shares”. That Italy was divided according to late Roman billeting law, with one third going to the Goths, was long the more or less unchallenged understanding of the mechanics of barbarian settlement in Italy. It fit then dominant paradigms, seeing the fifth century’s principal feature as violent barbarian conquest and viewing the barbarians as tribes searching for land. This consensus was challenged by Walter Goffart’s important book Barbarians and Romans, which changed the game in several ways. Goffart used the Italian evidence, rather than the Burgundian as had hitherto been more usual, to shape his general theory about how barbarians were settled. The Italian data were more contemporary, if in some ways less detailed than the relevant clauses of the Burgundian Code. Aquitanian Gothic and Burgundian settlements were separated from the documents that described them by a long time and more than one phase of settlement. Ennodius’ and Cassiodorus’ writings provided a direct view of how barbarian troops were settled in a Roman province. Goffart’s second, more famous, move was to place the settlement within the context of Roman taxation. Broadly, he argued that the Gothic settlers in Italy were granted not “thirds” of land but “thirds” of tax-revenue. Goffart showed that the Roman law of hospitalitas had nothing to do with salary, provisioning or settlement, but simply the temporary provision of shelter. He dismissed Procopius’ testimony as parti pris, motivated by a desire to justify Justinian’s reconquest. The Wars clearly manifest Justinian’s ideological campaign, claiming that the West had been lost to “barbarian invasion” and thus required reconquering. Procopius may have distorted evidence concerned with “thirds” to paint Theodoric in a bad light. The reference to a third of the land may be no more than hyperbole, and have nothing at all to do with the tertia referred to elsewhere. With Procopius set aside, Goffart turned to directly contemporary Italian evidence. First, there was rhetorical evidence in Ennodius’ and Cassiodorus’ writings declaring that the Goths had been settled without the Roman landowners feeling any loss. It was difficult, said Goffart, to envisage such statements being made if the senators had indeed just been stripped of a third of their estates. A millenarius had earlier been assumed command a thousand men, a chiliarch. The term can indeed mean this but Goffart pointed out that a millena was a Roman notional tax assessment unit, still used in Ostrogothic Italy. In imperial administrative practice, units of this sort, in specific numbers and perhaps drawn from particular fiscal assets, were set aside for designated purposes. For Goffart, a millenarius was a Gothic soldier paid with a millenaof tax-revenue, collected from specified taxpayers. Gothic troops were also given periodic donatives and received other rewards from the king. Some conflicts between Gothic soldiers and Italian taxpayers arose where the former attempted to convert a legitimate right to receive a salary in tax into the illegitimate ownership of the land on which that tax was levied. Goffart’s reading has considerable advantages, not least simplicity. No longer did one need to envisage a horde of agrimensores touring the Italian peninsula, assessing estates and their relative value before assigning measured portions to specific Goths. The state gained an independent coercive force – a standing army – and lost nothing; revenue collection was simplified. Nonetheless, most historians have remained unconvinced. Some critiques have been scholarly and struck important notes of caution; others less so. The most important issue is that, as formulated in 1980, Goffart’s thesis required readers to understand terra as having a specialist meaning as “fiscal revenue from the land”. Many authors argued that this seemed rather forced. In 2006, however, Goffart penned a more persuasive discussion drawing attention to the fact that even straightforward-looking references to land in modern legal documents mean more than simple designated areas of the earth’s surface. “Land” comes with a web of diverse types of relations and obligations attached. This ruled out any argument that simply proclaimed terra to be “unambiguous”, meaning “land” as though “land” were itself unambiguous. In any case, Goffart’s argument had never simply relied upon tendentiously translating words like terra in new, technical ways. It had accounted for many other relationships, largely ignored by anti-Goffartian works that proclaimed that “land is land”. The main problem for Goffart’s critics (and there are many) is that the root of the traditional view was the common appearance of tripartite division in the Roman law of hospitalitas and in some texts that discuss barbarian settlement. Whatever else one might have to say about Goffart’s studies, one thing is clear. It is, to my knowledge, the one area where no historian has attempted to contradict him: Goffart decisively showed that the Theodosian Code’s title dealing with hospitalitas had no bearing on the issues confronted in the texts describing fifth- and sixth-century barbarian tertia and the rest. Therefore, even if one finds Goffart’s argument entirely unconvincing, it is not viable blithely to return to what he has called “expropriationist” theses of the old style, based ultimately on that hospitalitas law. Sadly, however, that seems to have been the option most commonly adopted. Unwilling to accept Goffart’s “fiscalist” revision, they have continued into a sort of interpretive hyperspace, where no reading actually has any grounding but where we can at least shut our eyes, block our ears and pretend to know where we are. The imagined fixed points from which the anti-Goffartian view takes its bearings are, historiographically-speaking, spectres: reflections of something no longer there. None of this means Goffart’s interpretation is unproblematic; his most recent contribution to the debate certainly does not “definitively” settle the issue. Some preliminary ground-clearing is necessary. We must be absolutely rigorous in keeping to the precise issue under debate and to the particular data relevant to that issue. Evidence, for example, that the Goths owned land cannot be employed against Goffart’s view. His book concerned the salary of barbarian settlers within the Empire and thus their relations with the state. It discussed accommodation in that precise sense, not where or whether the barbarians owned land; the barbarians had to live somewhere. We must also avoid the temptation to assume that a single mode of settlement applied in all cases. Interpretation must relate to the particular documents under discussion and the specific social and political relationships described, neither element of which need have universal implications. One cannot fill in the blanks from other barbarian settlements or, conversely, export Italian Gothic details to understand other arrangements. The Goths had conquered and assumed direct government of the territory – Italy – which had to provide for its payment. The power-relations involved were therefore entirely different from those pertaining in Aquitaine in 418-9 or in Sapaudia in 442. In both of the latter cases the barbarians were moved and installed by a Roman government which dominated them militarily. Obviously, the victorious Goths in Italy are likely to have employed extant administrative arrangements such as may have been used in earlier settlements but we cannot assume that all details must therefore have been the same. The contrary seems more likely. Nonetheless, Goffart’s reading of the nature of illatio, tertia, sortes and millenarii seems preferable to its alternatives. Furthermore, late imperial Roman precedents existed for the general system suggested; such a system had apparently been used for the payment of elite field armies, such as the Goths, in a general sense, were. A Gothic warrior would be paid by a draft on taxation. He would collect this from designated tax payers and, as Gothic status seems to have been more or less equivalent to service in the field army, this relationship would be inherited by his sons alongside the obligation to military service. Most, if not all, of the key elements of this situation derived more or less directly from the late imperial military. It is crucial, as Goffart correctly noted, to underline that the relationship between Goth and Roman was that of government official to taxpayer. Beyond the legitimate payment of designated tax, it implied no other relative status. A Goth may have been of a higher or lower standing than the Roman or Romans ear-marked to pay him his salary. The Goffart thesis’ limitation is its insistence that this single system entirely sufficed in all cases. That requires complex and sometimes less convincing argumentation to explain away texts that do not fit. It is simpler to propose that, while Goffart’s proposed system provided the army’s essential salary, it was not necessarily the only means used. It has been argued before that different Gothic status groups may have wanted payment in different forms, rather than just in varying amounts. The resources of the sacrae largitiones and res privata, included landed estates and palaces as well as other sources of revenue, surely passed directly from Odovacar to Theodoric. At least oneGothic family (the Amals) received land upon which to live... It is hardly implausible that Theodoric, like the emperors, employed these resources to reward some of his followers. Grants of imperial fiscal land on long-term, emphyteutic leases are reasonably well attested as a form of imperial patronage. Theodoric had other – entirely traditional – resources that would fall within the sacrae largitiones and res privata. Confiscating defeated enemies’ property was normal in the aftermath of civil war. It is reasonable to see Odovacar’s senior supporters being expropriated, their land taken by the fisc and used to reward Theodoric’s followers, or some of them. Contemporary sources talk of significant massacres of Odovacar’s men. These had probably been paid according to a system like that proposed by Goffart but they lived somewhere and that property fell to the Gothic leader to retain or redistribute. We can easily envisage Theodoric’s senior or favoured followers being remunerated with land-grants. However, this has no bearing on the documents discussed by Goffart or the precise situations they describe; it has no relationship to the normal Gothic military salary. A considerable swathe of agri deserti (with no registered tax-payer) also existed. The late Roman state had continued to reward retiring veterans with land. Employing the agri deserti, yielding no tax revenue, for this cost the government nothing. Indeed, enmeshing these lands in a system of military obligations extended the fisc’s resources. Note, though, that this (like the confiscations) is irrelevant to discussions of sortes or tertia, which relate to tax revenue. Some dynamics within the Gothic army come into play here. Not all Theodoric’s men were warriors in the prime of life. Some had campaigned with him for twenty years and doubtless expected to settle down. Others may have fought on into old age, or accompanied the army as infirm ex-warriors, simply for the protection provided. Such people would not normally draw an annual salary, plus periodic donatives, in return for military service. Land was a more appropriate reward for them. Nonetheless, because Gothic soldiers’ status and obligations were heritable, lands so used were automatically entwined in issues of military service, especially when inherited by the next generation. Let us imagine an elderly Goth, an old companion of Theodoric and perhaps Thiudimir his father, being rewarded for long service with an Italian ager desertus. No longer militarily active, he has a son in the army, who collects his salary from designated taxpayers according to the Goffart system; he is a millenarius. When the old Goth dies, the son inherits his land. But, because he inherited his Gothic status and military obligations from his father, that land is now subject to military service. This mature Goth now supports himself from two sources, both ultimately granted by the government: the ager (no longer desertus) and the salary from the millena/e. Imagine another Goth, a young man who joined Theodoric’s army during its campaigns, with no elderly relatives to support. After the conquest of Italy, he is paid from designated millena. He marries an Italian woman and has children. He may or may not buy land during this time, but when he retires he is rewarded, in Roman fashion, with a landed allotment. The same features come into play as with the first Goth. His sons inherit his identity and military obligation. When they inherit the ager that land, like that of the older Goth discussed earlier, becomes part of a fiscal resource of a new type – land held tax-free, effectively in return for military service – and they have two sources of sustenance. This hypothetical reconstruction seems plausible. Note, first, that there has been no expropriation of any Roman landlord. Second, the Goffart interpretation of the standard means of furnishing a soldier’s salary remains entirely intact. None of the reconstruction forces any revision at all of Goffart’s reading of the precise texts dealing with the illatio, tertiae, or millena/millenarii. Crucially, however, the system described contained the seeds of potential change through time. Indeed, recognition of change and the passage of time are crucial to a full understanding of the issue. Within a generation or so we have a situation where Gothic soldiers draw a salary not just from drafts on taxation, where land with attached military obligations has also come into the equation. This situation is close to that visible in Merovingian Gaul slightly later in the sixth century. Indeed the growing connection between Gothic troops and specific lands and communities is precisely the dynamic suggested earlier, whereby earlier barbarian recruits (such as Odovacar’s followers) had gradually become fixed in the Italian landscape. The power relations also remain; the Gothic government retains a standing, salaried army while simplifying aspects of revenue collection and distribution. The advantage of this reconstruction is that it is dynamic. Over time, with the cycles of life, salaried Gothic soldiers evolved into people settled in communities with their families, with local social ties beyond those of tax-payer and tax-collector. They nevertheless remained an essentially military element of society. This allows us to retain the Goffart interpretation and understand references to Gothic landed properties without having to explain them away or, alternatively, use them as a basis for rejecting Goffart’s thesis about salaries. Goffart himself drew attention to another dynamic: the temptation to transfer a right to collect a salary from a designated fiscal asset into the latter’s outright ownership. This would completely change the relationships involved, making the tax-payer – whose status vis-à-vis the Goth’s was otherwise immaterial – into the Goth’s tenant. Some documents seem to represent attempts to prevent, or to investigate allegations of, such abuses. During weak, especially minority, government such abuses can easily be imagined, becoming more widespread and more successful. I have argued that this dynamic lies behind changes in Merovingian Frankish aristocratic landholding and power during a period of stress largely brought on by royal minorities around 600. If we accept Procopius’ account, this may even have lain behind the Italian army’s demands that led to Orestes’ downfall, though, as mentioned earlier, rejection of the whole story is probably the most consistent approach. Yet a further dynamic within the model is the purchase or acquisition by other means of landed properties; a Goth would be own these in the usual way. Unlike any lands granted as remuneration for service and subsequently inherited, these would not be free from the capitatio or other relevant taxes and obligations. Goths might however want to extend tax-exemption to all their lands. This, as again I have suggested for mid- and later sixth-century Gaul, would be a source of conflict. Overall, we should not see the system used to settle the Gothic army after 492 as taking a single form or imagine that the initial state of affairs remained unchangeably in place throughout the kingdom’s existence. Theodoric’s greatest problem after his victory over Odovacar was how to unify and govern Italy. The power of Roman aristocrats, especially those below the level of the old senatorial nobility, whose authority was probably more intensive within specific localities, as well as the potential threat posed by leading Gothic families, aggravated the difficulties to communication and the exercise of power posed by Italy’s difficult physical geography. Theodoric’s relations with the army illustrate how he dealt with this problem. To maintain his authority, the king had to scatter his forces throughout the peninsula in garrisons. Yet, this potentially exacerbated the problem just alluded to. A local commander (perhaps with a claim to nobility or even royalty just as good as Theodoric’s) might use his troops, perhaps in alliance with the region’s aristocrats, to challenge royal authority. One solution might be to ensure that Goths did not carry out their military service in the regions where their millenae were located, though whether such a solution was practical in Italy is doubtful. Theodoric seems instead to have imaginatively employed patronage and propaganda. The army was seemingly assembled regularly in the principal, northern royal centres: Pavia, Milan and Ravenna. At these gatherings, Theodoric paid donatives (a supplementary salary in cash), rewarded those who had done well and punished those who had not. This enabled a continuous distribution and redistribution of royal patronage, not only in the circulation of offices but also in the geographical redeployment of his men, ensuring that no family or faction could build up an established local power-base. Furthermore, it made Gothic noble or royal families compete for royal favour with their lower-born companions. When assembled for these purposes, the army was subject to manifestations of royal ideology aurally, in speeches, panegyrics and so on, and visually, in the pictorial and epigraphic decoration of the buildings used. The Senegallia Medallion demonstrates that some of the largesse distributed carried Theodorician propaganda. As manifested in Cassiodorus’ writings, these ideological productions stressed the army’s role as a pillar of civilitas and consequently the requirement for harmonious relations between Gothic troops and Roman civilians. This output, of course, also stressed Theodoric’s claim (at least by the latter half of the reign) to represent an ancient, uniquely royal dynastic claim to power. An association with the king, or royal authorisation, trumped any other claim to legitimate local authority but competition for this entailed subscription to Theodoric’s propaganda and ideology. This process undermined pre-existing Gothic social distinctions and ensured that Theodoric’s royal writ penetrated the geographically disparate local communities of his realm. Simultaneously, it assured the army’s continuing function, in spite of increasingly complex and deeper-seated social ties, as a state-controlled coercive force. None of this meant that relations between the army and local society were uniformly harmonious, any more than the imperial Roman army’s relations with civilians had been. The Variaecontain numerous instances of conflicts and complaints arising from the army’s behaviour. Cassiodorus repeatedly wrote that Gothic troops should not molest, harass or steal from the provincials in areas where they are stationed or through which they are marching. One document compensates the provincials of the Cottian Alps for depredations committed by the army as it passed through the region en route to Gaul in 508. Like Roman troops, Goths on campaign were supplied with food and other necessities (annonae) by the fisc. For the kingdom’s mountainous northern frontier garrisons this was especially important. Hungry troops could easily start to take what they wanted from their civilian neighbours. Cassiodorus had to write several documents ordering the rapid and effective payment of annonae. The Variae, a rich source for the army’s place within Theodoric’s realm, give a clear impression of continuity from the late imperial situation into Ostrogothic Italy as far as military affairs are concerned. Other than the fact that the army was made up of Goths, the Variae provide no a priori evidence that much had changed at all. Like late Roman troops, Gothic soldiers were subject to their own jurisdiction. It seems preferable to read the texts discussing the jurisdiction over Goths and Romans in this way rather than assuming that they refer to ancient Gothic tribal custom. One means by which serving Gothic soldiers were distinguished from civilians was apparently (as in other kingdoms) by their long hair (as capillati), a survival from the late Roman military. Whether this meant a particular hairstyle or simply referred to serving soldiers’ typically hirsute appearance (cp. the French poilu) is unclear. The heavy chlamysalso continued to be a sign of military authority. The army may have been a key institution in maintaining outward signs of Gothicness. A possible role in male socialisation will be discussed later but the late Roman army had long espoused real or invented signs of barbarian identity. Its jargon incorporated Germanic terms and the capillati’s long hair might have been another sign of “barbarian chic”. The army had also been a bastion of the Arian creed in late imperial Italy. Thus it was well suited to maintain the means of signifying Gothic identity, like Arian belief and use (at least for specialised technical terms) of the Gothic language. The army’s organisation is not clear. Theodoric is said to have disbanded the Roman guards regiments as useless ceremonial units. However, although the comes domesticorum vacans was certainly an honorific rank, the text cited to support the claim says the opposite. The Variae refer to domestici and scholares. Royal bodyguards are referred to, albeit with atticising Greek terms (hypaspistai, doryphoroi), in the accounts of the Gothic Wars. The reference to the horse- and foot-guards as domestici patres equitum et peditum, which perplexed Hodgkin,may point at an important structuring element of the Gothic army, to which I will return. As well as its guard regiments, the late Roman army had been organised into a field army (comitatenses) and frontier troops (limitanei or ripenses). Whether such a division persisted in Gothic Italy is unknown. The text in the Variae cited to illustrate the existence of limitanei does not support the suggestion. Troops were certainly stationed in frontier forts, and Theodoric referred to their function of keeping out the barbarians using traditional Roman vocabulary. The Variae, however, give no hint that they were recruited differently from the field army. The term miles is sometimes used, and Goths are not referred to. Goths are more often mentioned in the exercitus, on campaign. This might support the suggestion, logically enough given the “barbarian” composition of the late Roman field armies. However, the formula for the appointment of the duke of Raetia, a frontier province, makes clear that milites are, simply enough, soldiers in the exercitus, and contrasts them with Romani and provinciales. Nonetheless, Roman aristocrats – including Cassiodorus’ great-grandfather – had raised and commanded local defence forces during the fifth centuryand it is likely that city garrisons included Roman as well as Gothic soldiers. A distinction may then have existed. The army’s ethnic component has been one of the more debated elements of the Gothic military, especially since Patrick Amory proposed that Gothic identity was simply a kind of professional appellation, founded in late imperial ideology; to be a Goth was simply to be a soldier. Amory’s “rational choice” view of ethnicity has been forcefully criticised by Peter Heather, who contends that the Goths were a people, whose ethnic identity was grounded in a class of freemen. Amory’s hypothesis of entirely fluid ethnicity is too extreme, but Heather’s primordialism is too crude. At the heart of the controversy is both sides’ failure to appreciate two points. First, ethnic change does not imply a straight swap, exchanging one monolithic identity for another. Ethnicity is multi-layered; change involved adding another level, not rejecting one’s entire ethnic identity and replacing it wholesale with another. Different levels of identity can be situationally reordered in importance. Over time an identity can become that according to which one normally acts and is categorised, without one necessarily ever abandoning other identities. This process was illustrated earlier, in the formation of Theodoric’s Goths from the wreckage of Attila’s empire. The second, related point is that the process whereby a person or, better, a family might change from primarily self-identifying as Roman, for example, to primarily self-identifying as Gothic, could take a long time: at least a generation and perhaps two or three. This problem is accentuated by the short life of the Ostrogothic kingdom. Although long, Theodoric’s reign spanned less than two generations. The succession crises and instability that followed his death and, especially, the outbreak of the Gothic Wars (still only forty-six years after the Goths’ arrival on the Isonzo) probably put a brake on these processes. Thus it is hardly surprising that one cannot document clear-cut instances of complete ethnic change. Nonetheless, the Ostrogothic evidence does show the existence of the dynamics of such change, elsewhere in the post-imperial West. One index is the attestation of individuals with Gothic and Roman names. It must be remembered that the addition of a name was hardly uncommon in late antiquity, especially when associated with a change of status. Gregory of Tours added the name Gregorius when he entered the priesthood; his maternal great-uncle Gundulf doubtless took that Germanic name when he entered the service of the kings of Austrasia. This was one means of gradually changing one’s primary ethnic identification. Amory also drew attention to the aristocrat Cyprian, who had had his sons instructed in weapon-use and even had them taught Gothic. It is significant that this took place thirty years or so after Theodoric’s entry into Italy. It seems clear that the competition for royal patronage and the advantages associated with military service were causing even wealthy Italo-Romans to adopt a Gothic identity. Service in local garrisons could possibly bring a senior Gothic warrior’s patronage, entry into a military household and thence inclusion in the exercitus. On that basis, a Gothic identity might be adopted and eventually become dominant. Had the Amal kingdom lasted as long as the Merovingian these dynamics would likely have had similar results to those observable in the writings of Gregory of Tours. The life-cycle possibly played an important part in Gothic military service, as already intimated. The Variaemention that adolescent Goths came of age when they were liable to serve in the army,plausibly at fifteen. Cassiodorus mentions the training of iuvenes, apparently archers (saggitarii), and a mobilisation order commands the Goths to bring forth their young men. This is where the mention of domestici patres takes on an added significance, possibly as a reference to older warriors. Comparison with other post-imperial situations permits the suggestion that when he came of age a Goth learnt his trade either in the household of an older Gothic warrior or in units commanded by such veterans (like, perhaps, the archers of Salona). “Adoption by arms” was possibly important at this stage and would further bind military communities. Merovingian comites had their followings of pueri; it may be that the domestici in attendance on Theodoric’s officials ought to be seen in the same way. Clearly, they were paid by the fisc. At some point they may have graduated to more established units of milites, with a salary provided as outlined earlier. Finally, at a certain age, they may have married, acquired lands and settled down, becoming older warriors called out only for specific campaigns but training their own households. This proposed system looks superficially “primitivising”, making the Gothic military resemble the Zulu army’s married and unmarried impis. In fact it fits a range of evidence across post-imperial Europe. Even the late Roman army’s twinned regiments of iuniores and senioresmight imply similar careers for Roman soldiers. The distinction between doryphoroi and hypaspistaiamong Belisarius’ guards (whatever their actual designation) may suggest a similar life-cycle-based career within a regular army. The suggested role of the life-cycle within Gothic military service adds to other dynamics to underline change through time and the evolution of military identities and systems of remuneration. Theodoric carefully ensured his armies were well equipped and supplied. Cassiodorus’ writings contain numerous references to the upkeep of proper military camps, regular provision of annonaeand the supervision of armourers. The king also took a close interest in making sure of his cities’ proper fortification. It is often thought possible to determine the areas where the Gothic army was settled from the archaeological record. The distribution of particular types of metalwork, usually from a inhumations containing such objects as grave-goods (figure 1), has been understood to reveal zones of Gothic settlement. Such a straightforward interpretation cannot stand for a number of reasons. First, the origins of most of the material in question (largely feminine in any case) does not necessarily authorise its designation as “Ostrogothic”. Second, archaeological material does not have an ethnic identity, so, even if such material demonstrably came from the trans-Danubian Gothic homelands, one would not know whether someone interred with these objects was a Goth who had accompanied Theodoric to Italy, or was descended from one such. Third, perhaps most importantly, the material is found in very small numbers. If the costume associated with these objects was thought of as Gothic, clearly not all Goths were buried in this fashion. The rite cannot therefore simply reflect Gothic settlement. The context of such isolated finds is, consequently, crucial. As mentioned, most were deliberately and publicly deposited with the dead. 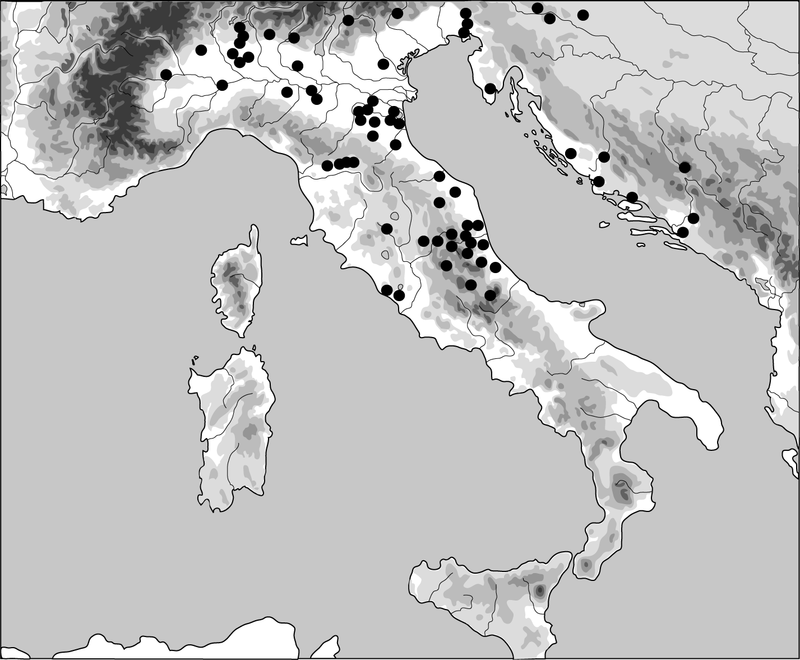 Although, as figure 1 shows, about fifty sites in Italy and Dalmatia contain such burials, usually only one or two such graves are known from each site. Some are from urban cemeteries, notably at major centres like Rome, Ravenna, Aquileia and Milan and frequently associated with churches. Why were some people buried like this when the vast majority were not? If these artefacts were associated with Gothic holders of political and military power, their display in the burial ritual must be significant. Weapon-burials and other furnished inhumations exist, especially in peripheral areas of Italy, in the pre-Ostrogothic era so the custom of displaying a dead person’s status in death was not new. Nonetheless, earlier barbarian troops do not generally seem to have taken to manifesting their ethnicity in this way. That the Goths did so must therefore somehow illustrate the impact of imperial collapse and Gothic conquest upon Italian social relationships. Furnished inhumation was a public display. In the suburban church burials with possible Gothic connotations, the audience of a burial was possibly made up of the politically powerful. In rural contexts, as perhaps, if the find does not represent a hoard, with the lavish burial of a woman at Domagnano (San Marino), that audience might have comprised other local landowners and lesser people. That women as well as (if not more often than) men were buried with these objects argues that the deaths of all members of certain kindreds could be marked by such displays. It also argues for a particular gendering of power. The families employing the ritual demonstrated the basis of their pre-eminence: their association with the Gothic holders of political and military power. This could be linked with competition for royal patronage within local communities and among the political élite. We must also, however, surely conclude that people adopting this costume in public ritual were not necessarily (and were possibly even unlikely to have been) Danubian incomers. Nonetheless, these burials’ fairly limited number shows that, while the death of a family member produced stress, the threat to local standing was not critical. These displays, however, still speak of the tensions involved in establishing local power-structures. The finds’ distribution thus most likely reveals the areas where such stress and competition for power were most common. It is highly likely that these included areas where Gothic newcomers were settled, but clearly it need have absolutely no relationship to such settlements’ overall distribution. The quality of the evidence, almost invariably discovered long ago in obscure and even dubious circumstances, is so poor that more detailed social and chronological analyses are impossible. What matters for present purposes is how, in however attenuated a form, it shows that the political and military power associated with the Goths reached down to local societies and power-struggles therein. That the styles of objects which seemingly manifested a connection with Theodoric’s government were feminine as often as masculine further supports the suggestion that, however they were salaried, the Gothic soldiers and their families became, over time, a fixed component of such communities and their politics. The archaeological record permits few statements about the equipment of Theodoric’s soldiers. Weapons are rare in the find complexes just discussed, not least because so many of them are female burials. Those which are known are unremarkable: lance-heads. Lavish items of horse-harness confirm the written sources’ indications that cavalry were a key element of the Gothic army. Several fortifications were occupied in the Ostrogothic period. Invillino (Friuli) is one of the best known and most thoroughly excavated. Although no phase was directly related to the Ostrogothic period, its Period III encompassed that era. The Ostrogothic army of Theodoric’s reign was clearly highly organised and efficient. Its Gallic, Spanish and Balkan campaigns were well-organised, well-led and usually successful. Success breeds success, of course. Warriors continued to join Theodoric and the repeated experience of victory made Gothic troops battle-hardened and confident. The accounts of Theodoric’s kingdom’s cataclysmic downfall in the Gothic Wars provide much detailed, if problematic, data on the Gothic army in action. A significant mistake has been the use of Procopius’ account to shed light upon the nature of the Goths who entered Italy in 489. Numerous dynamics were at work within the kingdom – especially within its army – that made the armed forces of the 530s to 550s quite different from those of the 480s and 490s. “The Goths”, as they appear in Procopius’ narrative, owe their nature to the working through of those dynamics. Procopius’ account demands care. Although filled with the sort of detail beloved by military historians – and generally absent in early medieval western Europe– it cannot be taken as straightforward description, even if Procopius was an eye-witness of some events. The Wars are enmeshed in very traditional classical ethnographic stereotyping and Procopius himself wrote in learned Attic Greek, striving to fit his account alongside the great examples of the historical genre: Thucydides and Polybius. Hence the appearance of doryphoroi and hypaspistaiin Roman and Gothic armies. Procopius’ writing – at least initially – was heavily imbued with Justinianic ideology about the rightness of the reconquest. His accounts of the Gothic forces, especially in the set-pieces of the siege of Rome, have therefore to be handled with caution. Procopius mocked those barbarians who wanted to be Romans. Thus the tragicomic accounts of incompetently-deployed Gothic siege towers and Gothic generals who fail to note the allegedly decisive military difference between the two armies, which Belisarius spotted early in the campaign: that the Romans have mounted archers and the Goths do not. Some such accounts are surely hyperbolic. Procopius’ account of Gothic ‘oplitoi must surely be heavily ironic. Although an apt description of an armoured close-fighting spearman protected by a large round shield, the term’s cultural baggage – the Attic hoplite, civilised citizen-soldier par excellence – and its incongruity when applied to barbarian warriors besieging Rome would not have been lost on Procopius’ readers. Procopius less critical attitude towards Totila may stem as much from Totila correctly performing the role of barbarian warlord allotted to him by Graeco-Roman ethnography – unlike the comic philosopher-king Theodahad or the bumbling Wittigis, would-be poliorcetes– as from any disillusionment with Justinianic policy. Close scrutiny suggests that the two sides were actually very alike. The possible distinction between older and younger warriors, the former acting as officers for the latter, especially within bodyguard units, has already been mentioned. Another shared feature seems to be the warriors’ ability to fight mounted or on foot, according to the situation. This fluidity, rather than a formal division into units of infantry and cavalry, is characteristic of the early medieval west. That the Gothic army, as Cassiodorus makes clear, was a well-organised, more or less regular army on the Roman model, rather than the barbarian horde often envisaged in Byzantine accounts or uncritical modern studies based on the latter, also brought the two sides closer together. Indeed, given the predominance of troops recruited from beyond the frontier in the East Roman army, the Gothic army may have been considerably more “Roman” than the forces opposing them. This irony seems to be heavily played upon in Procopius’ account. The similarities between the armies certainly facilitated (as in Theodoric’s conquest) the changing of sides between the armies. Soldiers in the opposing forces could be barely distinguishable from each other. The Gothic army’s dismal showing in the earliest phase of the war probably attests to the previous decade political stresses and a lack of active campaigning. Most of the experienced Gothic troops were located outside Italy, in the Balkans (where they scored some important early successes against the invading Romans), in Provence and in Spain, where they were probably involved in sometimes successful campaigning against the Franks. Their opponents, by contrast, were battle-hardened and confident veterans, used to victory under Belisarius (even if frequently more by luck than judgement). The dynamics of the earlier Theodorician period were reversed. They would turn back again when Totila’s forces experienced a long and unbroken run of success. The Gothic warrior was characteristically equipped with horse, sword and shield, as written and archaeological evidence from Theodoric’s reign also suggests. Some used bows, at least when dismounted, and spears were thrown from a distance as well as used in hand-to-hand fighting. Totila’s instructions to his men to discard all weapons other than their swords (if Procopius is to be believed) made sound sense in the context of the battle of Busta Gallorum. A rapid charge directly into close-combat would avoid the fatal temptation to exchange missiles with the Romans, who had the advantage of numbers, especially in archers. The wars’ effects on the Italian peninsula are well-known. One was surely the arresting of any dynamics that might have led to ethnic changes like those in Gaul and Spain and embryonically attested in Theodoric’s reign. Harder lines were drawn between Goths and Romans, even though almost certainly more on the basis of political choice than biological descent. Most of the rank and file of the 520s will have been born and grown up in Italy, making them significantly different from warriors born and raised within the peripatetic Ostrogothic army in the post-Hunnic Balkans. It is unlikely that more than a handful of those mustered in Theodoric’s last military assemblies, even patres domestici, had any clear memory of a life outside the seemingly stable confines of Romano-Gothic Italy. It would be yet more mistaken to see the soldiers facing Belisarius’ troops, let alone those who followed Totila and Teïas against Narses, as shaped by anything other than late antique Italian, Provençal or Dalmatian culture, like their “Roman” or “provincial” neighbours. Marriage further blurred familial and genealogical distinctions. Besides, the processes discussed earlier had already led to Italo-Romans joining the army and perhaps adding a Gothic dimension to their own hierarchy of identities. The Goths had always incorporated other groups, sometimes retaining an ethnic label,sometimes not. Byzantine deserters joined the Goths during the wars and doubtless also added a Gothic identity. Those who returned to the East Romans surely abandoned it again. None of this implies “incomplete assimilation”or solid boundaries between Goths and others. We do not know whether Roman soldiers who returned to Justinian’s armies were the same men as had deserted earlier. A Roman deserting to the Goths became, in some ways, a Goth, although the non-Italian and frequently indeed non-imperial origin of these troops continued to mark them out among their new comrades. Given the Italian upbringing of most Goths, it was easier for a Goth deserting to Narses to become a Roman. The dynamics discussed throughout this chapter permit a more subtle reading of the Goths’ ultimate downfall than that recently and repeatedly championed. The account of the kingdom’s final demise has been claimed to show the Goths as a “people” with a defined identity founded in a large class of freemen with a direct link to the king, as well as an aristocratic class. The decisive defeat of a portion of the Gothic army, and the threat to wives and children posed by Eastern Roman military operations has been presented as sufficient proof of this contention. The conclusion, however, by no means necessarily emerges from the evidence. The revival of the discredited Germanist notion of a class of Königsfreie need not detain us. The Gothic armies’ stratification and inclusion of a larger body of rank and file than leaders is hardly surprising; nor is the idea that the rank and file had a significant political role. Numerous dynamics within the Italian kingdom embedded Gothic military communities within peninsular society and politics. The edges of these communities doubtless hardened during the wars and it cannot be astonishing that the wives and children, whole families, of serving Gothic soldiers should have been more at risk than in the peaceful conditions of Theodoric’s reign. It might have been safer to take them on campaign than to leave them behind, giving some Gothic forces a character resembling those that entered Italy in 489. The consequences of the Gothic field armies’ (and navy’s) serious defeats similarly have no necessary bearing on the nature of the Italian Goths. The destruction of its field army at Adrianople in 378 had rendered the Eastern Empire – with far greater military manpower reserves than the Italian kingdom – effectively incapable of serious offensive military action for perhaps a decade. The western field army’s slaughter at the Frigidus was decisive for the western Empire; it never had a sufficient breathing space to rebuild a substantial force of the same standard. Troops can be replaced in numbers but not necessarily in quality, military experience and so on, and Procopius makes clear that limited manpower, compared with that of the Empire, was a worry that dictated Gothic strategy in the 540s and 50s. The men accompanying Totila in his desperate charge at Busta Gallorum or who died with Teïas in the cataclysmic battle of Mons Lactariuswere doubtless the best warriors the Goths could muster. Others still died in the disastrous naval defeat of Sena Gallica in the Adriatic. That these defeats effectively ended Gothic resistance is considerably less surprising than the facts that it took three bloody engagements to do so and that some Gothic garrisons continued to hold out even then. The Goths’ subsequent disappearance from history is easily encompassed within the dynamics discussed throughout this chapter, albeit in reverse; indeed Goths continue to be attested in Italy after the completion of the “reconquest”. Although primarily military in composition and function, the Goths had been more than simply an army when they invaded Italy under Theodoric. By the time of Totila’s and Teïas’ deaths, sixty-odd years later, the Italian Goths had – unsurprisingly – changed in many ways. Their primarily military character had, however, endured throughout. A kingdom created by the sword had perished by it. · Anonymous Valesianus: Ammianus Marcellinus, vol. 3, ed. & trans. Rolfe, J.C., London, 1939, pp.506-69. · Burgundian Code: The Burgundian Code, trans. Drew, K.F., Philadelphia, 1972. · Cassiodorus, Chronicle: MGH Auctores Antiquissimivol.11, Chronica Minora saec. IV. V. VI. VII, vol.2, ed. Mommsen, T., Berlin, 1894, pp.109-61. · Cassiodorus, Variae: MGH Auctores Antiquissimi vol.12, Cassiodori Senatoris Variae, ed. Mommsen, T., Berlin, 1894; (selection) Cassiodorus: Variae trans. Barnish, S.J.B, Liverpool, 1992; (summaries with some translations) The Letters of Cassiodorus: Being a Condensed Translation of the Variae Epistolae of Magnus Aurelius Cassiodorus Senator, trans. Hodgkin, T., London, 1886. · Codex Theodosianus (CTh): The Theodosian Code and Novels and the Sirmondian Constitutions, trans. Pharr, C., Princeton, NJ, 1952. · “Consularia Italica” (a collection of annalistic texts grouped by Theodor Mommsen under this title, highly misleading in almost every way but convenient for citation): MGH Auctores Antiquissimivol.9, Chronica Minora saec. IV. V. VI. VII, vol.1, ed. Mommsen, T., Berlin, 1892, pp.249-339. · Edictum Theoderici (ET): MGH Legum Vol.5, ed. Bluhme, F., Hannover, 1875-89, pp.145-79; Lafferty, S.D.W., Law and Society in the Age of Theoderic the Great: A Study of the Edictum Theoderici, Cambridge, 2013, pp.243-94. · Ennodius, Life of Epiphanius: MGH Auctores Antiquissimi vol.7, Ennodi Opera, ed. Vogel, F., Berlin, 1885, pp.84-109; The Life of Saint Epiphanius by Ennodius. A Translation with an Introduction and Commentary, trans. Cook, G.M., Washington DC, 1942. · Ennodius, Epistulae: MGH Auctores Antiquissimi vol.7, Ennodi Opera, ed. Vogel, F., Berlin, 1885. · Gregory of Tours, Histories: MGH Scriptores Rerum Merovingicarum 1/1 ed. B. Krusch & W. Levison, Hannover, 1951. Gregory of Tours: The History of the Franks, trans. L. Thorpe, Harmondsworth, 1974. · Malchus: The Fragmentary Classicizing Historians of the Later Roman Empire, ed. & trans. Blockley, R.C., Liverpool, 1981, vol.2, pp.401-462. · Priscus: The Fragmentary Classicizing Historians of the Later Roman Empire, ed. & trans. Blockley, R.C., Liverpool, 1981, vol.2, pp.221-400. · Procopius, Wars: Procopius, ed. & trans. Dewing, H.B., vols.1-5, London, 1914-28. · Amory, P., People and Identity in Ostrogothic Italy, 489-554. Cambridge, 1997. · Bierbrauer, V., Invillino-Ibligo in Friaul. Die römischer Siedlung und das spätantik-frühmittelalterlische Castrum. Munich, 1987. · Bierbrauer, V., “Archeologia degli Ostrogoti in Italia”, in I Goti, ed. Bierbrauer, V., von Hessen, O., & Arslan, E.A., Milan, 1994, pp.170-213. · Brown, T.S., Gentlemen and Officers: Imperial Administration and Aristocratic Power in Byzantine Italy, A.D. 554-800, Rome, 1984. · Cesa, M., “Il regno di Odoacre: la prima dominazione germanica in Italia”, in Germani in Italia, ed. Scardigli, B., & Scardigli, P., Rome, 1994, pp.307-20. · Fehr, H., & von Rummel, P., Die Völkerwanderung. Stuttgart, 2011. · García Gallo, A., “Notas sobre el reparto de terras entre Visigodas y Romanos.” Hispania 1 (1940-41) : 40-63. · Goffart, W., Barbarians and Romans AD 418-585: The Techniques of Accommodation. Princeton, 1980. 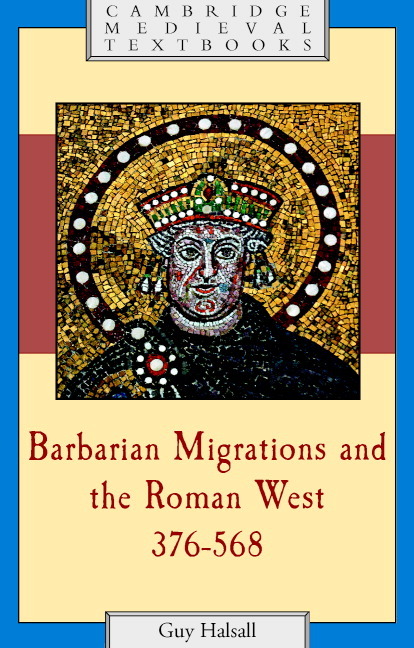 · Goffart, W., Barbarian Tides: The Migration Age and the Later Roman Empire. Philadelphia, 2006. · Goffart, W., “Administrative Methods of Barbarian Settlement in the Fifth Century: The Definitive Account.” Gallien in Spätantike und Frühmittelalter Kulturgeschichte einer Region, ed. S. Diefenbach & G. M. Müller(Millennium Studien zu Kultur und Geschichte des ersten Jahrtausends n. Chr. Vol.43), Berlin, 2013, pp.45-56. · Halsall, G. “Funny foreigners: Laughing with the barbarians in late antiquity”, in Humour, History and Politics in Late Antiquity and the Early Middle Ages, ed. Halsall, G., Cambridge 2002, pp.89-113. 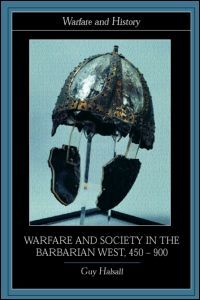 · Halsall, G., Warfare and Society in the Barbarian West, 450-900. London, 2003. · Halsall, G., Barbarian Migrations and the Roman West, 376-568. Cambridge, 2007. · Halsall, G., Cemeteries and Society in Merovingian Gaul. Selected Studies in History and Archaeology, 1992-2009 (Leiden, 2010). · Heather, P., Goths and Romans, 332-489. Oxford, 1991. · Heather, P., “Theoderic, king of the Goths.” Early Medieval Europe 4.2 (1995) : 145-73. · Heather, P., The Goths. Oxford, 1996. · Heather, P., “Gens and regnum among the Ostrogoths” in Regna and Gentes: The Relationship between late Antique and Early Medieval Peoples and Kingdoms in the Transformation of the Roman World, ed. Goetz, H-W., Jarnut, J., & Pohl, W., Leiden, 2003, pp.85-133. · Heather, P., “Merely an ideology? – Gothic identity in Ostrogothic Italy”, in The Ostrogoths, from the Migration Period to the Sixth Century, ed. Barnish, S.J., & Marazzi, F., (Woodbridge, 2007), pp.31-60. · Humphries, M., “Italy, AD 425-605”, in Cambridge Ancient History vol.14,Empire and Successors, A.D.425-600, ed. A.M. Cameron, B. Ward-Perkins & M. Whitby, Cambridge, 2000, pp.525-51. · Jones, A.H.M., The Later Roman Empire, 284-602. Oxford, 1964. · Kaldellis, A., Procopius of Caesarea: tyranny, history and philosophy at the end of antiquity. Philadelphia, 2004. · Kulikowski, M., “Nation versus army: a necessary contrast?” in On Barbarian Identity: critical Approaches to Ethnicity in the Early Middle Ages, ed. A. Gillett, Turnhout, 2002, pp.69-84. · Liebeschuetz, J.H.W.G., “Alaric’s Goths: Nation or army?” in Fifth-Century Gaul: A Crisis of Identity, ed. J.F. Drinkwater & H. Elton (ed. ), Cambridge, 1992, pp.75-83. · Lot, F., “Du régime de l’hospitalité.” Revue Belge de Philologuie et d’Histoire 7 (1928): 975-1011. · Mommsen, T., “Ostgotische Studien.” Neues Archiv 14 (1889) : 223-49, 451-544. · Pohl, W., “Telling the Difference: Signs of ethnic identity”, in Strategies of Distinction. The Construction of Ethnic Communities, 300-800, ed. Pohl, W. & Reimitz, H., Leiden, 1998, pp.17-69. · Pohl, W., Die Völkerwanderung. Eroberung und Integration. Stuttgart, 2002. · Rummel, P. von, Habitus Barbarus:Kleidung und Repräsentation spätantiker Eliten im 4. und 5. Jahrhundert n. Chr. (Berlin, 2005). · Staab, F., “A reconsideration of the ancestry of modern political liberty: the problem of the “King’s Freemen” (Königsfreie).” Viator11 (1980) : 51-69. · Thompson, E.A., The Huns, Oxford, 1996. · Wharton, A.J., Refiguring the Post-Classical City. Dura Europos, Jerash, Jerusalem and Ravenna. Cambridge, 1995. · Wolfram, H., History of the Goths. Berkeley, 1988. · Wolfram, H., The Roman Empire and its Germanic Peoples. Berkeley, 1997. Wood, I.N., “Theoderic’s monuments in Ravenna”, in The Ostrogoths, from the Migration Period to the Sixth Century, ed. S.J. Barnish & F. Marazzi (Woodbridge, 2007), pp.248-63. The process is well described in Heather, Goths and Romans, pp.227-308. Priscus, frag. 11.2 (Blockley), pp.266-75. Fehr & von Rummel, Die Völkerwanderung, pp.75-80; Heather, Goths and Romans, pp.240-51; Heather, Goths, pp.124-9; Pohl, Die Völkerwanderung, pp.118-25; Thompson, Huns, pp.167-76; Wolfram History of the Goths, pp,258-68; Wolfram, Roman Empire, pp.139-43. The debate has focused more often on Alaric’s Goths than the Ostrogoths, but the same issues apply. A clear statement in defence of the “people on the move” interpretation may be found in P. Heather, The Goths (Oxford, 1996), pp.169-78. For the discussion of the earlier Goths, many points of which can be made, by analogy, for the Ostrogoths, see Liebeschuetz, “Alaric’s Goths: Nation or army?”; Halsall, Barbarian Migrations, pp.189-94; Kulikowski, “Nation versus army”. For the Ostrogoths, the locus classicusis Malchus, fr.20 (Blockley). The opinion has repeatedly been expressed by Peter Heather, but with most sophistication in his Goths and Romans, and Goths. Halsall, Barbarian Migrations, pp.190-1. See also CTh7.1.3. But see Halsall, Barbarian Migrations, pp.439, 444, 447. For this, see Halsall, Barbarian Migrations, pp.257-83 for political history, 328-338 for social and economic conditions, and the references given there. Humphries, “Italy, AD 425-605”. Cesa, “Il regno di Odoacre”, p.310; See Variae1.19 for its successor, the fiscus gothicus. For the war, see Anonymous Valesianus, pars posterior, 10.50-56; Cassiodorus, Chronicle 1320-31; “Consularia Italica” 639-49; Ennodius, Life of Epiphanius, 109-19. Heather, Goths, pp.219-20; Wolfram History of the Goths, pp.281-4. The intervention of a Gothic army from Gaul was critical in breaking Odovacar’s siege of Theodoric in Pavia (Anonymous Valesianus, pars posterior 11.53). Whether this represented pan-Gothic cooperation is unlikely. It may be preferable to see the Gallic faction chancing its arm in Italian politics in established fifth-century tradition, with Alaric II following his uncle, Theodoric II’s, example. Halsall, Barbarian Migrations, pp.422-47, for summary of the debate to c.2005 and references. Goffart, Barbarian Tides, pp.119-86. Goffart, Barbarians and Romans, pp.73-80. The loci classici are Variae1.14 & 2.16-17. See Bjornlie, elsewhere this volume, for the straightforwardly fiscal connotations of the illatio tertiarum. That the tertiain question related to the fiscal payment schedule simplifies the situation further still. Goffart, Romans and Barbarians, pp.80-88. The key text is Variae 5.27. Mommsen, “Ostgotische Studien”, p.499, nn.3-4, had related millenarii to millenae. Lot “Du régime de l’hospitalité”, p.1003, and nn.5-6, thought millenarii were officers. Generally, however, it had been assumed that a millena was a fixed amount of land. See Variae 4.14, 5.26-27, 5.36. Goffart Romans and Barbarians, pp.89-100. Goffart, “Administrative Methods of Barbarian Settlement”. That such a system for payment was employed in Ostrogothic Italy is demonstrated abundantly clearly by ET126 and, especially, 144. García Gallo, “Notas sobre el reparto de terras”; Wolfram, History of the Goths, p.224. Jones, Later Roman Empire, pp.417-20. Variae 4.32 says that the property of the proscribed belongs to the fisc. The Edictum Theodorici specifies the fisc’s claim to take over the property of convicted criminals in some cases, where there were no heirs. ET 112-3. Variae 1.18 seems to me to refer more easily to the distribution of expropriated land (and abuses of that situation) when Theodoric conquered Italy than to illegitimate claiming of tax-revenue. Jones, Later Roman Empire, pp.812-23, is the classic basic account. The illegal retention (by his uncle) and management of the paternal inheritance of an adolescent Goth who is of sufficient age to perform his military service is discussed in Variae 1.38. Here, the text could relate at least as easily to an inherited draft on fiscal revenue as to landed property. Goffart continues to view my own modified version of his thesis as “expropriationist”, something it has never been. Goffart, “Administrative methods”, p.48. Halsall, Warfare and Society, pp.46-50 and refs. Such a situation may well lie behind the situations described in Variae 1.26 and 4.14. Halsall, Warfare and Society, pp.46-7. Theodoric’s concern with effective and rapid communications is visible in Variae 1.29, 2.19, 4.47, 5.5, etc. The Burgundian Code (54.1) suggests that something like this was practised in that, smaller realm. This is well analysed by Heather, “Theoderic, King of the Goths”, pp.152-65. Variae 5.27: bonos enim laus malos querula comitatur. Heather, “Theoderic, King of the Goths”, pp.162-3. Some of the settings for Theoderician ritual is analysed by Annabel Wharton, Refiguring the PostClassical City, pp.105-47; See also Wood, “Theoderic’s monuments” (which oddly ignores Wharton’s more theoretically sophisticated analysis, as do the discussants: pp.263-77). Variae 2.8, 3.16, 3.24, 3.38, 5.26. Heather, Goths and Romans; Heather, “Theoderic King of the Goths”. ET 43-44 and 46 undermine the use of patronage to influence legal cases. Most clearly perhaps in Variae 4.36. Variae 3.38, 4.13, 4.36, 5.10-11, 5.13, 5.26, 6.22, 7.4. Variae 4.49. See discussion in Amory, People and Identity, pp.344-6; Wolfram, History of the Goths, p.103. Amory, People and Identity, pp.236-76. The idea received a formidable rebuke in the review of Amory’s book by Robert Markus, Journal of Theological Studies 49 (1998), pp.414-7. Jones, The Later Roman Empire, p.256; Moorhead, Theoderic, p.254. Halsall carelessly repeats the statement, on the basis of these authorities: Warfare and Society, p.45 and n.24. Procopius, Secret History 26.27-28, says that Justinian’s officials disbanded these corps, which had been generously left in place by Theodoric, in spite of their uselessness. Variae, 1.10, Hodgkin Letters of Cassiodorus, p.150, n.2. Wolfram, History of the Goths, pp.316-7, referring to Variae 1.11 claims that the troops (milites) commanded by Servatus, dux of Raetia, “cannot have been Goths”. Wolfram does not explain why but Heather, “Gens and regnum”, p.118, n.89, builds on his foundations (mis-citing the source) to allege that Servatus is “said to have led limitanei (i.e. inferior quality troops)”. Variae1.11 makes no mention of limitanei or Romans. Amory, People and Identity, esp. pp.149-94. Halsall, Barbarian Migrations, pp.35-62, 332-6, for full discussion. Gregory of Tours, Histories 6.11. Variae 8.21. Full fluency in Gothic seems to me to be less necessarily implicit in Cassiodorus’ statement than a competent command of army-Gothic argot. Mommsen reads the text as domestici partis equitum et peditum. This may seem a more logical reading but is not grammatically satisfactory. Patres seems to be the more common manuscript form but the manuscripts do not really allow a decision. I am grateful to M. Maxime Emion for discussion of this point. See also Napoleon’s Old, Middle and Young Guards. Halsall, Warfare and Society, p.199, n.110. von Rummel, Habitus Barbarus, pp.323-37. Halsall, Cemeteries and Society, passim. Bierbrauer, “Archeologia degli Ostrogoti”, pp.194-202. Halsall, Warfare and Society, pp.1-6, 177-80. Cameron, Procopius; Kaldilis, Procopius of Caesarea. These are terms which appear in the accounts of classical Greek hoplite warfare and, in the case of the hypaspistai, in Polybius’ accounts of the warfare of the Alexandrian Macedonian army. Procopius, Wars, 5.18.42, resolved at Wars, 5,27.25-8. Halsall, “Funny foreigners”, pp. 111-2. Halsall, Warfare and Society, pp.180-8. Gregory of Tours, Histories 3.21, refers to the Goths’ recapture of territory lost after Vouillé. This must have occurred under the leadership of Theoderic’s Spanish regent (and later Visigothic king) Theudis. Eighteenth- and nineteenth-century commanders similarly ordered troops to attack with unloaded muskets when an advance was to be pressed briskly with “cold steel”. The account in Brown, Gentlemen and Officers, pp.1-60, is classic. Like the Gepids of Variae 5.10-11. Late imperial units frequently bore ethnic titles. The Gepidic origins of many of the troops discussed should not be doubted but one ought not to assume that these Gepids were any more a “people” on the move than the late imperial regiments of Franci, Alamanni or Parthi, similarly redeployed with their wives, children and camp followers. Phrases like “incomplete assimilation” have highly conservative political connotations which should be noted. It seems, again, to be politically revealing that the suggestion that the Gothic rank and file did not blithely follow their officers and social betters’ instructions should be represented as a surprising and defining feature of Gothic society. Halsall, Barbarian Migrations, pp.199-200, 243. Procopius, Wars 8.29-32 (Busta Gallorum); 8.35 (Mons Lactarius); 8.23 (naval defeat). Amory, People and Identity, pp.314-5.